7 customers were able to try this promotional product before it sold out at 8:00 PM on December 16. 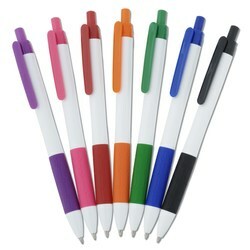 The regular, guaranteed lowest price on 250 of these pens would be $167 with set-up! This promotional pen is “write” on! Your logo is blasted against this sleek white barrel. Complementing fresh accent colors border your message for extra emphasis. 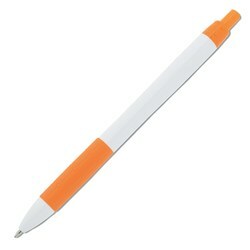 Textured rubber grip provides a comfy cushion for your writing hand. Your price includes a one-color imprint on the barrel, beside the clip.